Updates for May and June. I will go over the contents in the Normal A2 replay, it being the more notable accomplishment this time. The C2 replay is also quite good, and A1 is a work in progress, so I will try to raise it. How much I don't know. All the same, Gasoline's A1 replay is absolutely amazing, so I may not try to score higher than, say, 60 million. On the Normal mode, I am also very interested in improving B1, and want to raise my current score (55,881,900) much higher as well. Aside from this, I am probably going to tackle the Extra stage next, when I feel ready. Stage 1 before Lily: poor. I get the first 30% area, but afterwards, freeze is messed up and kills extra fairy, removing points from the next freeze. Lily White: Nonspell 1 is passable, with 3 out of 4 30% area. however, 4th freeze killed lily, so the 5th (small freeze) is excluded. Nonspell 2 is OK, but I don't understand how to get highest score on the last freeze without losing frozen items. Second half of stage 1 is fair. Luna Nonspell 1 is terrible, with the first 6 (smaller) freezes being far below average, and the next 3 (bigger) freezes all below 30% area. However, the second nonspell is OK, which is pretty important for the run. Two 30% area freezes on Luna Cyclone, this is important to make stage 2 better, but otherwise Luna Cyclone gave me some terrible movement luck which removes score. Overall a bad stage 1 score, but enough PF for stage 2. End stage 1 with 7,590,570 score, 253%PF, 567% motivation. Keep in mind I do not use PF on Luna Nonspell 2, instead, I use it on stage 2. Stage 2 pre-Lily Black: Fine. The PF nets me 309,600 from the freeze, and an additional 133,480 (items, damage) totaling at +443,080. Worthwhile, in my opinion. Lily Black: Nonspell 3 luck is what is truly important here, but Nonspell 2 is also rather easy to mess up. Nonspell 2 was good, but Nonspell 3 luck was just OK. Stage 2 post-Lily: The Knife-Ring Fairy 3rd freeze was wrong, so I lost a 30% area. However, I got all the frozen items from the three duos at the end. Besides, I didn't end up needing the extra PF from a better knife ring freeze, so it's not that bad. Start Sunny with 13,368,600 score, 230%PF, 780%motivation. A decent start. Nonspell 1: Close to an early defeat, but this is ordinary. Final PF position was weak. Prism Flash: Good. I actually want to defeat it on the last wave, but doing this with ice without losing the SCB is hard. So this works. Nonspell 2: It is important to start this with high enough PF to avoid having to use 3 suicides. Thankfully my PF was easily high enough for this. I do a little bit of milking at the end to ensure I have enough leftover PF for a smooth stage 3. PF positions were good. Diamond Ring: This is the bane of all runs. In order to get awesome scores, you want to get good luck here. At the very least, avoid bad luck. The difference between terrible and awesome luck is something crazy like 2.5 million. Not counting the last freeze which is always lower, I average around 550,000 per freeze. This is good luck. Blue Deflection: The point here is farming enough PF and then using PF at the end. Sometimes I would hardly get enough time, so a lot of runs almost died here, or actually did die here. I prefer to start stage 3 with at least 136%PF. I need 200% by the time I use two bombs, and I can easily get 64% on the way. However, in critical situations I can make do with 135 or even 134%PF, but this is very risky. The PF you gain on stage 3 before the 2nd bomb goes as follows: 20%+PF>20%+PF>20%+PF,2-3%+PF>2-3%PF. 2-3 depends on those very tiny freezes you do. If I know I have to get 3%, I will make sure I get that, but it may delay the timing of the bomb, kill a fairy, or some other stupid thing like that, in a worst case scenario. Anyway, stage 3 is started with 27,756,100 score, 144%PF, 671% motivation. This is a very good start. Right at the beginning, I make a little mistake with the 2nd freeze, which is smaller. However, other than that, no big complaints before midboss, but notably the very last freeze was really high. Star Sapphire midboss. In my opinion, this is hardest part of the run. The nonspell is pretty easy generally, but may be hard to optimize. Her spell, on the other hand, ended many runs. Going over the nonspell, this is a major source of points, and luck is also a big component. The strategy is 4 suicide freeze, 3 bomb freeze (not necessarily in this order) and hopefully enough health left over for a final, smaller (but still 30% area freeze). If Star moves too close to the side, you cant go through two rings like you are supposed to, losing you points. However, there is an upside to a movement pattern like this, which is that if you bomb freeze, the regular freeze will not hurt Star, and so you are guaranteed to have enough leftover health for the final freeze. My movement pattern went something like this. Star generally hung close enough to the middle (but not always in great spots) that I could go through two rings, but at one point she went too close to the side, losing me points. However, because she had taken so much damage, this ended up being OK. I didn't gain back the points I lost compared to good luck, but I did get 20% extra PF, so it's not a terrible trade. So, the luck was good enough, but not amazing. Moving on to her spell, it was extremely scary. Before second freeze, my point-blanking was not good enough, and I get only about 60% ice power. A mistake like this will often spell doom, but somehow I recovered. I quickly noticed my charge was too low, go back under side for a split second to shoot her, and then end up with around 76% ice power instead, which makes it more feasible to recover. There were still many bullets in the way to try to pointblank for the 3rd freeze, but I made it. Even so, several of the dashes to pointblank Star were close calls. I'm lucky I didn't die on this. Stage 3 second half: Clean. 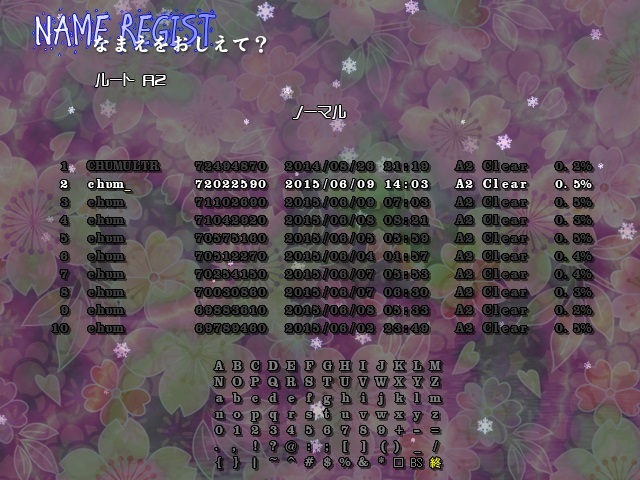 3 Fairies (Star leader) start: 41,234,110 score, 118%PF, 605% motivation. This is the highest score I've had at this point. I've had multiple high 40s runs before, but never started with over 41m prior to this. Both PF and Motivation is good for executing my strategies. Nonspell 1, Spell 1, and Nonspell 2, all go well according to plan. Ice Dissolver was a little scary, but it went well. The plan is to milk it for a higher PF, so I can execute my strategies. Although some points are dropped from SCB, overall this is worth the extra points I can gain from using an extra PF and suicide. Nonspell 3 is immediatley a mistake. I pointblank Star and get only 60% ice power. I do a suicide freeze at the start, and without higher ice power, I lose score. Around 100,000 dropped. Next, strategy is to alternate between these 4 things, not necessarily in order. Very big Freeze without damaging Sunny. Use this when you respawn from a suicide. Calculate how to freeze depending on all the fairy positions as well as your own, for maximized score without damaging Sunny. Sunny is the major source points. You can get 300,000+ with good movement luck for a freeze like this. Smaller freeze without damaging Sunny. If you can, pointblank Star Sapphire and you may be able to use a bigger freeze. Otherwise, You can try to nudge Star+Luna with your shot to up your ice power further and you may be able to even reach 30% area freezes. PF. With my strategies I can use 3PF here, with only 2 suicide. Very important to make sure 2nd PF does not kill Sunny, it will kill her if you damage her with your regular freezes. Suicide Freeze. Do at least 2 of these, but possibly 3. Unfortunately I only got to do 1 suicide freeze, because I lost the second life on accident instead of suiciding. This cost some score as well, but I didn't need to spend a 3rd life because my PF% ended up high enough for 3 bombs. Luck was also not so good, so many points were dropped here compared to a great score. Orion Belt: I had some trouble adjusting to the RNG, but I did manage to keep Luna alive for a long time. Unfortunately, this attack was defeated one wave early. Dropped a little score, but not a terribly huge amount. Nonspell 4: First freeze is a nice trick to gain 20% PF without actually damaging Star. It segues right into a bomb. I can't complain too much, but this really could have gone way better. On the second to last freeze, the 3rd ring is completely unfrozen! This is horrible, and I tried to adjust, but then the last freeze defeated Star without me wanting. She must have had just barely not enough health to survive that freeze. Lame! But, good enough to not kill the run. Fairy Overdrive: Fair. Resource farming was as good as necessary, and I got the sidefairy frozen items. SCB is pretty much always going to be low on this, and at least I did cap it in time. I didn't get Star's items, so that's 60,000 dropped. Final Spell: This was scarier than it has any right to be, but nothing majorly wrong. A very good run in my opinion, but I can't stress how important Gasoline's 71.3 million run is. The research Gasoline has done to make this score a reality is amazing, and I simply followed most of their strategies with only a few changes and improvements. FW, with its lack of practice modes and the like, is not an easy game to research, and especially not because of its depth and organic nature. A2 in particular is very very much based on luck. Patience and consistency is huge to have that luck in a well executed run. I will abstain from writing commentary on the C2 run bit by bit, but I will say that it was also quite well played and is worth watching for those interested in FW. I feel it is a little worse, because I have not spent the proper time to truly polish all the strategies to that level of optimization. plus the luck could be much better. But, it may be hard to beat all the same. On a sidenote, with a total score at 1.788b, 1.8b is getting closer and closer. Perhaps I can reach it before 2016. Other games: I did play some Batrider and managed to reach letter score (10 mil) on Special Course with Solo Carpet. However, I did not clear the game... Which is a shame, since a clear would have been something like 10.6 or 10.7 mil. I believe 12 million is possible if you are willing to grind out incredible luck over the course of the run.